Winter storm season in Western Europe is similar in some respects to what impacts the Pacific Northwest -- gusty winds, heavy rain, and other associated impacts that can blast through Britain, France, and the Netherlands among other locations. Storms vary in impact but they can be pretty potent. 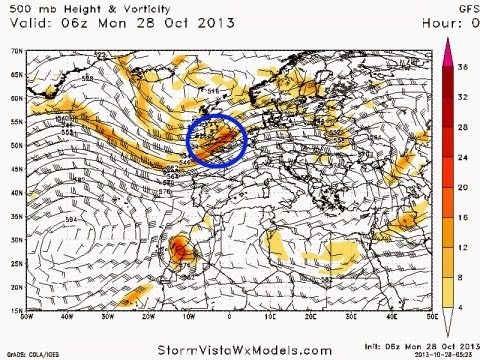 Monday morning's storm that blasted through the United Kingdom and the Netherlands traces its origins to the coastal system that developed Tuesday night into Wednesday along our coastline. It intensified into a powerful ocean storm that moved through the North Atlantic, blasting into the UK early yesterday morning with winds as high as 99 miles per hour and bringing London nearly 70 mph wind gusts. Over the North Sea, winds gusted to 119 miles per hour! Over 500,000 in Southern England lost power at one point yesterday morning. In terms of storm, it wasn't anywhere as bad as 1987's Great Storm, but it was still a potent reminder of what Nature can be about in a more violent state. 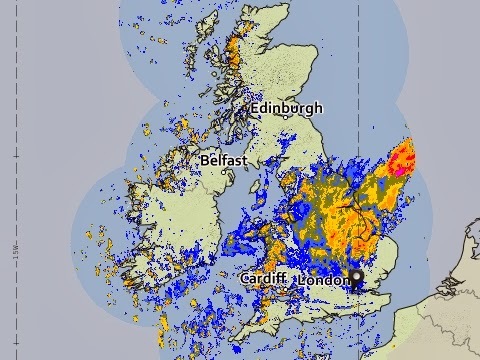 This was the radar shot from 7:30 local time, with the core of the storm system still pushing northeast through the eastern part of England and having just exited London at this point. The core of this storm impacted Southern England thinks to a strong area of vorticity and a strong jet streak that shoved through Southern England. Winds aloft were over 100 mph at the 500 mb level and given the high level of energy pushing through, it's no surprise that a good chunk of those gusty winds made their way to the surface. An active, albeit a bit less "intense" pattern is in store for the balance of the week in the UK as a powerful storm cuts off near Greenland, with varying disturbances pushing east through the North Atlantic to impact Western Europe through week's end. While the impacts from the next couple of rounds of rain will pale in comparison to what hit London yesterday morning, it will be a far from tranquil stretch of weather for the rest of this week.